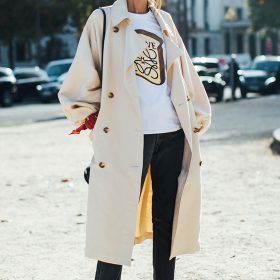 One of the classics: Forever one of the trendiest coats a woman can own, buying yourself a trench coat on Fashiola today is more like an investment, than a purchase. A camel colored trench coat is an iconic look in the world of fashion, paired with a classic pair of black skinny jeans and some heeled Prada boots or whatever shoes the weather permits. It doesn’t matter if you’re looking for a luxury designer, an affordable alternative or a style that’s been injected with modern trends – we’re sure you’ll find it on Fashiola!